The CoaguChek XS system is a simple, convenient and safe device that helps you to monitor your coagulation status at home. This thereby reduces the time that you have to spend in hospital, at general practices or at anticoagulation clinics. Self-Monitoring with CoaguChek XS means that anticoagulant therapy can be constantly optimised, which decreases the possibility of complications, such as clots or bleedings. The most important advantage of Self-Monitoring is that the coagulation status can be regularly and frequently checked, so that anticoagulant therapy can be adjusted when necessary. Frequent testing is essential because factors such as drugs, illness, nutritional intake, alcohol, travelling and stress may interfere with the coagulation status. Oral anticoagulants have a narrow therapeutic range and the response to a standard dose varies widely both between patients and within patients over time. Changes in patient health, lifestyle or diet and other drugs can alter the effectiveness of the medication. Diet: foods high in vitamin K such as sprouts, cabbage, etc. These potential interferences, added to the fact that each individual has a different reaction to vitamin K antagonists, require that prothrombin time (PT) or International Normalized Ratio (INR) is monitored regularly. The time within the therapeutic range is considered as a key indicator of the patient’s safety in terms of less potential complications such as haemorrhage or thrombosis. Oral anticoagulant dosages are then adjusted by the healthcare professional according to the results of the PT/INR test. With the CoaguChek XS system you can test anywhere and anytime: CoaguChek XS is easy to transport due to its low weight and size. Testing strips are available in the UK on NHS prescription and can be supplied by your local chemist. If you are buying privately the PIP Code for a pack of 24 is 3195732. Different testing strips are available so make sure you specify the system you have is the Roche CoaguChek XS. The recommended testing frequency during Self-Monitoring is once a week but a lower frequency of testing can be justified based on institutional or patient conditions. However patients should always stay in contact with a Healthcare Professional at all times. 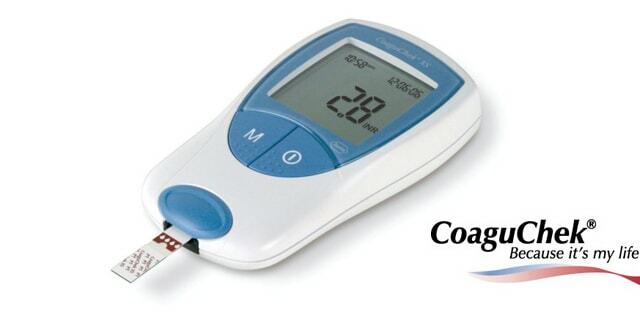 For product support or information call the CoaguChek Careline free on 0808 100 7666. UK - £399.00 including postage and packaging. Recommended Retail Price. We are happy to provide links to commercial sites and have details of various items for sale in our products and services section. However we do not endorse any products, services or treatments. The product depicted on this page is an advertisement. The accompanying text and images have been supplied to us by the manufacturer. All trademarks and registered trademarks shown on our web site are acknowledged and are the property of their respective owners.